Tickets 16.50 GBP in advance from Ray's Jazz at Foyles, 113-119 Charing Cross Road, WC2 (Mon - Sat 9.30am to 9pm, Sun Midday to 6pm), Sterns, 293 Euston Rd, W1 (next to Warren Street Tube) (Mon to Sat 10.30am to 6.30pm). Or you can pay by credit card via Ticketweb (08700 600 100 - 24hrs). Please note that advance tickets are not available from the club and seating is first come first seated. This was a very beautiful show, with everyone on top form. Ronnie Scott's weaved its magic over the assembled throng. 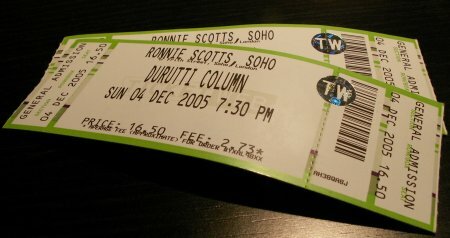 It was also a special moment as it was the first Durutti show for my friends Steven, John and Corinne. John Metcalfe and Louisa Fuller played a 30 minute set of material from John's latest album 'Scorching Bay' on viola (John) / violin (Louisa) / piano (both) with taped backing. John and Louisa will play a similar set but with a full five-piece group at The Purcell Room on London's South Bank on Saturday 17 December. At about 9.20, The Durutti Column took to the stage and Vini made his usual introductory thank-yous and also introduced his new Jimmy Page Les Paul guitar. The band then played a new piece with Vini using the aforementioned new guitar (not sure if this was the one people have been referring to as 'Blue Period'). Then 'Otis' with 'Blind Elevator Girl (Osaka)' piano ending. Then came 'Sketch for Summer', 'Jacqueline' and 'Woman' (aka 'Sealine' with Les Paul). There followed a "solo" interlude with Vini playing songs from the new album and then 'All That Love And Maths Can Do' (from 'Circuses and Bread' - or 'Bread And Circuses' if you will). Finally in this section there was a new solo Vini piece which ended with a lovely mouth organ solo by Keir Stewart. The main set closed with 'The Beggar' and 'Requiem for Mother' before they returned for 'Revolver' which has matured into a truly stunning closing piece from its early origins. Sadly there were no further encores. Afterwards everyone was in good humour, including Fraser who has a song about him on LC and Lydia who is likewise immortalised on 'The Sporadic Recordings'. Thanks to 'Hommage to Martinu' on the DC Yahoo Discussion Group for setlist details.